"As soon as we heard about the campaign, we knew we wanted to get involved." Scotmid is delighted to announce its support of the Edinburgh Evening News Shockingly Easy campaign to help sports clubs in the Lothians with a life-saving defibrillator. Scotmid has pledged to £250 towards the cost of a defibrillator to 11 sports clubs close to its ‘Heart Safe’ shops in the region that have their own in-store devices. Kirkliston and South Queensferry (KSQFC) has become the first club to benefit, kick-starting a funding drive by the club to secure a defibrillator for its 250 youth footballers. 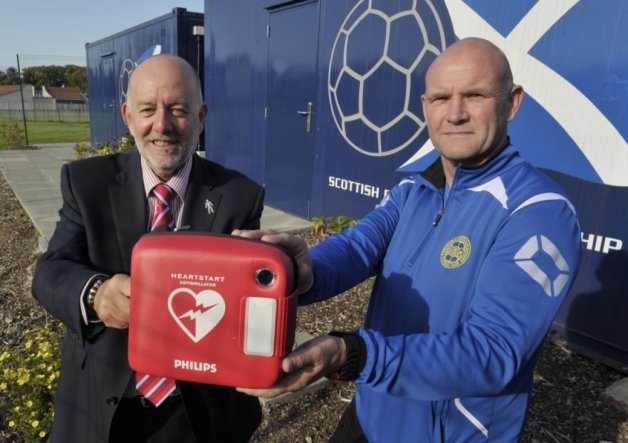 KSQFC secretary Mark Richardson said that, once purchased, the life-saving device would travel with the team to its games, and will be made available to the community in a pavilion at Allison Park in Kirkliston where it will be stored. Malcolm Brown, Head of Corporate Communications for Scotmid Co-operative, said: “It is absolutely superb that the Edinburgh Evening News has launched the Shockingly Easy campaign. As soon as we heard about the campaign, we knew we wanted to get involved. “Over the past three years, Scotmid has invested a great deal in supporting our most vulnerable communities by installing defibrillators in many of our stores. Across Edinburgh and the Lothians, we have 11 ‘Heart Safe’ stores with these life-saving machines, which are a vital resource for the local community to access in a cardiac emergency. The 11 ‘Heart Safe’ Scotmid stores with defibrillators in Edinburgh and the Lothians are: Leith Walk, Easter Road, Nicolson Street, Stockbridge, Gorgie, Portobello, Crewe Road, Kirkliston, Prestonpans, Mayfield and Armadale.